The ultimate mountain biking adventure on Vietnam's mountains that will tickle every adrenaline junkie's fancy. Ride through spectacular scenery with roads that range from asphalt, potholed or off-road. It's a tough journey with the incredible experience of seeing minority tribes and their colorful culture. Adventure awaits in Vietnam for families who like to explore and discover together. 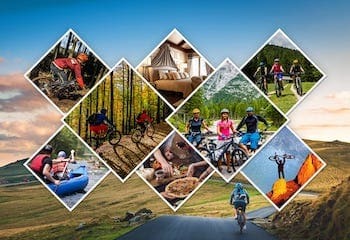 This tour caters to all ages of children and adults alike by providing a variety of bikes and traveling options that allow everyone to be involved. Included are many cultural highlights and activities, such as boating, exploring ruins and former military hideouts, and even helping to cook a meal at a home-stay. The tour will provide unforgettable experiences for young and old and will be a family holiday to remember. Take a short but wonderfully fulfilling tour around the unspoilt Mai Chau valley and explore the tracks and trails of this stunning mountainous region. Discover the Mai Chau valley and trails on a three-day journey into Vietnam's heartland. Descend into lush valleys, resplendent with a vast array of greens, and ascend to the challenging heights that will reward you with magnificent views all around. Experience the warm hospitality of the local hill tribes, the rich cultural heritage and the natural splendor of this very special part of Vietnam. Spend a thoroughly enjoyable three days exploring the unique habitat and wonderfully picturesque Red River region of northern Vietnam. Experience the beauty and quiet charm of this delightful region of Vietnam, riding past traditional villages, ancient temples and endless green fields of rice. The Red River and its tributaries have created a rich and fertile land, which is not only extremely picturesque but also a land filled with fascinating history and culture. Experience the magnificent city of Prague on a superb 2.5 hour tour taking in major sights at a leisurely pace. Discover breathtaking panoramic views of the city of a thousand spires. Riding through exquisite Letna and Petrin parks, you will make your way towards the famous Prague Castle and back through the New Town with a friendly and knowledgeable guide. If you are a connoisseur of the finer things in life and also enjoy a spot of relaxing cycling, then this is the tour for you. Discover the endless charms of a region steeped in exquisite winemaking, one which offers the cyclist a pleasurable and intoxicating mix of off-road trails through protected wetlands, winding rivers, coastal vistas, bountiful orchards, vineyards and superb countryside. Off the bike, you'll join an exclusive behind the scenes tour at the Church Rd winery and have plentiful opportunities to explore the plethora of vineyards dotted along the detailed route. Three nights of boutique, luxury accommodation await you, as well as two gourmet dinners, private car transfers and lunch reservations. A true treat to behold. This self-guided tour explores the famous Barossa, Clare Valley and equally impressive McLaren Vale wine regions via the seat of a bike. Fun, off-road cycling, beautiful scenery, iconic wine and sumptuous food all combine on this ultimate gourmet exploration. Biking on easy, safe and well laid off-road paths, you'll discover the incredible food and wine of South Australia on this fantastic cycling tour. You'll enjoy visiting world-class cellar doors for wine tastings and cycle on well laid, off-road and relatively easy cycling trails across South Australia. Experience the Riesling Trail in the Clare Valley & the Coast to Vines Rail Trail in McLaren Vale and savour the best of this gourmet region of Australia.